Pseudomonas syringae is a widespread bacterial plant pathogen, and strains of P. syringae may be assigned to different pathovars based on host specificity among different plant species. The genomes of P. syringae pv. syringae (Psy) B728a, pv. tomato (Pto) DC3000 and pv. phaseolicola (Pph) 1448A have been recently sequenced providing a major resource for comparative genomic analysis. A mechanism commonly found in bacteria for signal transduction is the two-component system (TCS), which typically consists of a sensor histidine kinase (HK) and a response regulator (RR). P. syringae requires a complex array of TCS proteins to cope with diverse plant hosts, host responses, and environmental conditions. Based on the genomic data, pattern searches with Hidden Markov Model (HMM) profiles have been used to identify putative HKs and RRs. The genomes of Psy B728a, Pto DC3000 and Pph 1448A were found to contain a large number of genes encoding TCS proteins, and a core of complete TCS proteins were shared between these genomes: 30 putative TCS clusters, 11 orphan HKs, 33 orphan RRs, and 16 hybrid HKs. A close analysis of the distribution of genes encoding TCS proteins revealed important differences in TCS proteins among the three P. syringae pathovars. In this article we present a thorough analysis of the identification and distribution of TCS proteins among the sequenced genomes of P. syringae. We have identified differences in TCS proteins among the three P. syringae pathovars that may contribute to their diverse host ranges and association with plant hosts. The identification and analysis of the repertoire of TCS proteins in the genomes of P. syringae pathovars constitute a basis for future functional genomic studies of the signal transduction pathways in this important bacterial phytopathogen. Bacterial signal transduction pathways sense the cellular external environment and regulate cellular functions in response to environmental signals. A mechanism commonly found in bacteria for signal transduction is the two-component system (TCS). Bacterial TCSs are common components of complex regulatory networks and cascades, often associated with global regulation as well as with regulation of virulence. TCS genes are typically located within the same operon encoding two signalling proteins: a transmembrane sensor histidine kinase (HK) and a cytoplasmic response regulator (RR), which may sometimes be carried by a single polypeptide to form the hybrid HKs . The mechanism of signal transduction by TCS proteins is based on phosphotransfer reactions between histidine (H) and aspartate (D) residues in highly conserved signalling domains of the HKs and their cognate RRs. TCS proteins have a modular organization, which may give rise to highly complex structures, but the core structures and activities are maintained . HKs are typically organized as homodimers with two functionally and structurally distinct domains: a highly variable N-terminal extracytoplasmic sensory domain, and a more conserved C-terminal cytoplasmic transmitter domain, also known as the dimerization/phosphoacceptor domain [2, 3]. The sensor domain varies in length and amino acid sequence from one HK to another, conferring specificity for different environmental stimuli. In most HKs, the transmitter domain shows high sequence conservation, especially within a set of six recognizable motifs or boxes designated H, N, F, G1, G2, and G3. In particular, the H box contains an invariant H residue that is autophosphorylated in an ATP-dependent manner . In contrast, CheA-like HKs that function in chemotaxis lack the sensor domain and differ from other HKs in their domain constitution and organization, where the H box of the transmitter domain resides at the N-terminal end of the protein [5–8]. LytS-like HKs also differ significantly in their domain architecture from other HKs [9–11]. RRs generally contain at least two functional domains: a conserved N-terminal receiver domain (REC domain) that is phosphorylated by the HK at a strictly conserved D residue, and one or more variable C-terminal output domains . Modulation of the phosphorylated state of the RR controls either expression of the target genes or cellular behaviour. The principal type of bacterial RRs are transcription factors that regulate gene-expression with DNA-binding helix-turn-helix (HTH) output domains [1, 3, 12, 13]. Hybrid HKs contain both a HK transmitter domain and a REC domain in a single large polypeptide, and are characterized by multi-step phosphotransfer reactions [1, 7, 14]. The availability of complete genome sequences for a continually growing number of bacteria has allowed the definitive assessment that TCS proteins are present in almost all bacterial species [1, 8, 12]. Genomic analyses demonstrate the enormous impact of TCSs on environmental adaptation of bacteria, and reveal a wide variation of HK and RR numbers between different bacterial species [7, 8, 12, 15–20]. The bacterial plant pathogen Pseudomonas syringae causes disease on a variety of plant species, and strains of P. syringae have been classified into different pathovars depending on their host range among different plant species . Infection of host plants by P. syringae involves growth on leaf surfaces as an epiphyte, that enters plant leaves through stomata, multiplies to large populations in the apoplast and produces disease symptoms [21, 22]. P. syringae injects effector proteins into the cytoplasm of plant cells by means of the Hrp type III secretion system . Genome comparisons indicate that P. syringae is significantly different from other Pseudomonas species [23, 24], suggesting that in the adaptation to the phytopathogenic lifestyle its genome must have undergone fundamental changes without a reduction in size. The complete genomic sequences of three economically important pathovars of this plant pathogenic bacteria have been determined: P. syringae pv. tomato (Pto) DC3000, pv. syringae (Psy) B728a and pv. phaseolicola (Pph) 1448A [25–27]. In these genomes, over 10 to 12 % of the genes are dedicated to regulation, which may reflect the need for rapid adaptation to the diverse environments encountered during epiphytic growth, plant colonization and pathogenesis [25–27]. Genome analyses of these P. syringae pathovars revealed fewer extracytoplasmic function (ECF) sigma factors (10 ECF sigma factors) than in related Pseudomonas with different lifestyles . Recently, analysis of the Pto DC3000 genome sequence allowed the identification of 69 HKs [28, 29] and 71 RRs, 21 of which were hybrid HKs . In a different study not including CheA-like HKs, 64 HKs were identified in Pto DC3000, 20 of which were hybrid HKs . Hence, P. syringae requires a complex array of TCS proteins to cope with diverse plant hosts, host responses, and environmental conditions. The availability of complete genomic sequences of three different P. syringae pathovars makes it possible to conduct this comparative genomic study to identify and analyse the TCS proteins of P. syringae. The putative HKs and RRs in Psy B728a, Pto DC3000 and Pph 1448A were identified by searching the complete genome sequences for proteins containing HK and RR domains using Pfam HMM profiles. Four CheA-like HKs in each P. syringae genome were identified in BLASTP searches using as template the CheA HK of E. coli  (Table 1). In addition, BLASTP searches of the HKs and RRs found in each P. syringae pathovar against the genomes of the other two pathovars allowed the identification of additional HKs and RRs. The genomes of P. syringae pathovars were found to contain large numbers of genes encoding TCS proteins: 68 HKs and 93 RRs in Psy B728a, 69 HKs and 95 RRs in Pto DC3000, and 70 HKs and 92 RRs in Pph 1448A (Table 1; see Additional File 1 and 2). The number of genes encoding hybrid HKs (REC-HKs) was 20 in Psy B728a, 22 in Pto DC3000 and 24 in Pph 1448A (Tables 1 and 4). The HMM search method used in this work retrieved hybrid HKs as well as RRs (Table 1). No TCS proteins were identified on any of the plasmids of Pto DC3000 and Pph 1448A. In recent studies, similar numbers of TCS proteins for Pto DC3000 have been reported: 69 HKs [28, 29] and 71 RRs, 21 of which were hybrid HKs ; or 64 HKs in a study not including CheA-like HKs, 20 of which where hybrid HKs . Although the number of ECF sigma factors in all three P. syringae genomes (10 ECF sigma factors) is only about half that found in other Pseudomonas species [24, 32], the number of TCS proteins is close to that found in other Pseudomonas genomes . Distribution of HKs and RRs found in the genomes of P. syringae pv. syringae B728a, pv. tomato DC3000 and pv. phaseolicola 1448A. Putative TCS gene clusters in the genomes of P. syringae pv. syringae B728a, pv. tomato DC3000 and pv. phaseolicola 1448A. a Whenever a HK or RR of P. syringae has been assigned a function in the literature and/or an annotation in databases, the corresponding protein name is mentioned; borganization of each TCS on P. syringae genomes (HR, 5' histidine kinase-3' response regulator; RH, 5' response regulator-3' histidine kinase); c an additional gene is located in between the RR and HK genes; d HR in P. syringae pv. phaseolicola 1448A; e genes with disrupted reading frames. Orphan HK and RR genes in the genomes of P. syringae pv. syringae B728a, pv. tomato DC3000 and pv. phaseolicola 1448A. a Genes with disrupted reading frames. Hybrid HK genes in the genomes of P. syringae pv. syringae B728a, pv. tomato DC3000 and pv. phaseolicola 1448A. HK and RR genes were scattered over the entire chromosomes of the three P. syringae pathovars. Conservation of the genetic organization between HK and RR genes was analysed in the genomes of Psy B728a, Pto DC3000 and Pph 1448A allowing the identification of gene clusters containing HKs and RRs that constitute putative TCSs (Table 2). Like in other bacterial species, many P. syringae HKs and RRs were encoded by clusters of adjacent genes: 37 putative clusters of complete TCS genes in Psy B728a, 34 in Pto DC3000, and 33 in Pph 1448A (Table 2). For the remaining HK or RR genes, their partner genes could not be predicted from genetic organization and, therefore, they were considered as orphan HKs or RRs. The orphan HKs were 11 in each P. syringae genome, and the number of genes encoding orphan RRs was very high: 36 in Psy B728a, 38 in Pto DC3000 and 35 in Pph 1448A (Table 3). Finally, the comparative genomic analysis allowed the identification of a core of complete TCS protein orthologues among the three P. syringae pathovars, that is composed by 30 putative TCS clusters (HK and RR) (Table 2), 11 orphan HKs, 33 orphan RRs (Table 3), and 16 hybrid HKs (Table 4). HKs have been classified on the basis of phylogenetic analyses and the sequence relationships of the residues surrounding the H-box [7, 8, 17, 34]. Furthermore, several new domains with putative biological functions have been described in HKs, and domain architecture has proven particularly informative for analysing multi-domain proteins involved in signal transduction [2, 11, 12, 35]. The phylogenetic analysis and examination of the region around the H box of P. syringae HKs showed that three of the five major HK types found in E. coli  were present in P. syringae: Type I (IA, IB, IC), III, and CheA-like HKs (Table 1; see Additional File 1). In contrast, Type II and IV HKs were totally absent from P. syringae. However, the LytS-like HK FimS/AlgZ and HKs containing GAF domains did not cluster within any of the defined HK types of E. coli , and formed two separate HK groups: LytS-like HKs and GAF-HKs. GAF sensor domains are commonly found cytoplasmic signalling domains in the N-terminal region of HKs [2, 34], and appear to act as binding sites for small ligands, such as cyclic nucleotides (cAMP and cGMP) and small molecules, which modulate the catalytic activity of the target protein [36, 37]. In addition, analysis of domain architecture of P. syringae HKs showed a conserved core structure for each HK type in P. syringae (Figure 1). The conserved core of Type III HKs and LytS-like HKs only had a HK-like ATPase (HATPase_c) catalytic domain and a His_kinase domain, respectively. The conserved core of CheA-like HKs contained a C-terminal CheA regulatory domain but lacked the HisKA domain. The conserved core of Type I HKs and GAF-HKs had a central region with HisKA and HATPase_c domains fused to additional domains on the N-terminal end: a HAMP domain in Type IA, a PAS domain in Type IC, and GAF plus phytochrome (PHY) binding domains in GAF-HKs (Figure 1). Schematic representation of the conserved core structures found in P. syringae HK types. The domains are not drawn to scale. HAMP, domain found in H Ks, A denylyl cyclases, M ethyl binding proteins and P hosphatases (PF00672); HisKA, HK dimerization/phosphoaceptor domain (PF00512); HATPase_c, HK-type ATPase catalytic domain (PF02518); REC, receiver domain (PF00072); PAS, signal sensor domain (PF00989); HPt, H istidine-containing P hosphot ransfer domain (PF01627); H-kinase_dim, HK homodimeric domain (PF02895); GAF, signal sensor domain (PF01590); PHY, phytochrome domain (PF00360); His_kinase, region within bacterial HKs (PF06850). 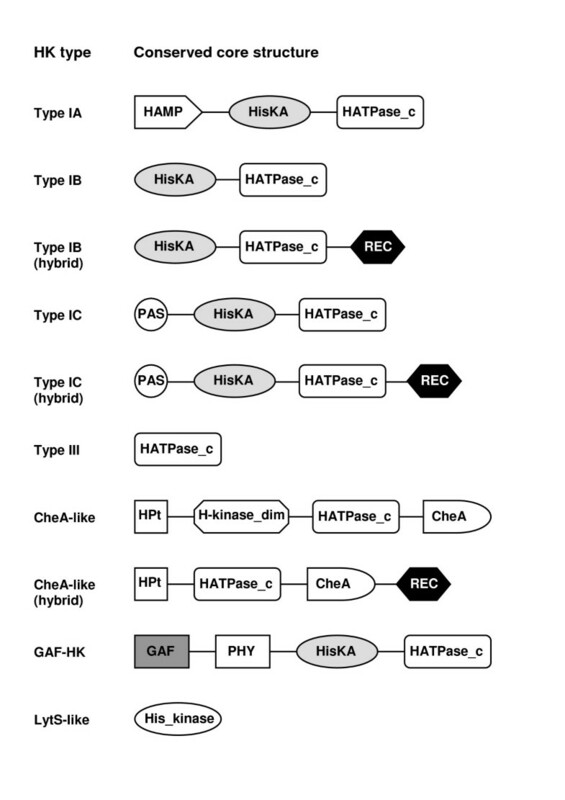 Orphan HKs fell into two HK types: Type I (IA, IB and IC), and GAF-HKs (Table 3); and hybrid HKs of P. syringae belong either to the Type I (IB and IC) or CheA-like HKs (Table 4). PSYR3504 (BphP1) and PSYR2385 (BphP2) HKs have been previously described as bacteriophytochromes (BphPs) that belong to the HWE_HK family [4, 38]. Similar to other BphPs, the bphP1 (PSYR3504) gene of P. syringae pathovars is located in an operon downstream from a bphO gene, encoding a putative heme oxigenase. RRs show a great variety of output domains and domain combinations. Recently, bacterial and archaeal RRs have been classified into families based in their domain architectures . RRs typically consist of an N-terminal REC domain fused to a C-terminal HTH DNA-binding output domain (OmpR, NarL, NtrC, LytR, AraC, Spo0A, Fis, YcbB, RpoE, and MerR) that activates or represses transcription of specific target genes [2, 12]. In addition, prokaryotic genomes encode a variety of RRs with unusual domain organization: RRs with enzymatic output domains (GGDEF, EAL, HD-GYP, CheB, CheC, PP2C, and HisKA), RRs with RNA-binding output domains (ANTAR and CsrA), RRs with protein- or ligand-binding output domains (CheW, PAS, GAF, TPR, CAP_ED, and Hpt), RRs with the REC domain as a stand-alone module, and RRs with domains of unknown function . The RRs identified from the genomes of P. syringae pathovars were assigned to these different RR families  according to the domain architecture and phylogenetic analysis (Table 1; see Additional File 2). Bacterial RRs without a REC domain are extremely rare, but a number of enhancer-binding proteins (EBPs) lack the REC domain and normally function as RRs . EBPs are involved in the activation of the bacterial transcription by interaction with the sigma-54 RNA polymerase holoenzyme . In P. syringae, the HrpR and HrpS proteins show a high sequence similarity to the NtrC family of transcriptional RRs and have been previously identified as unusual EBPs lacking the N-terminal REC domain; however, similar to other EBPs, they retain the domain that interacts with the sigma-54 RNA polymerase holoenzyme plus the C-terminal DNA-binding domain [39–42]. In addition, the NarL-like RR CorP of Pto DC3000 that is involved in the regulation of coronatine biosynthesis [43, 44] also lacks the REC domain. Thus, HrpR, HrpS and CorP proteins were not identified during the search of RRs in P. syringae genomes with the HMM profile that targets the RR REC domain, nevertheless these proteins were considered orphan RRs (Table 3). A close analysis of the distribution of genes encoding TCS proteins revealed that there are important differences in TCS proteins among the three pathovars of P. syringae that may contribute to their diverse host ranges and association with particular host plants. A number of the identified TCS genes were unique to each P. syringae pathovar without counterparts in the other two pathovars. The corRSP regulatory region (PSPTO4704-4706) of coronatine biosynthesis and the copRS TCS (PSYR1497/1498) regulating copper resistance were only present in Pto DC3000 and Psy B728a, respectively. Other TCS genes unique to each P. syringae pathovar were: PSYR2114, PSYR2939, PSYR2940 and PSYR3084 in Psy B728a; PSPTO0785/0786, PSPTO2329, PSPTO4079, PSPTO4080 and PSPTO5573/5574 in Pto DC3000; PSPPH0770, PSPPH0778, PSPPH0944 and PSPPH1261 in Pph 1448A. The unique hybrid HKs PSPPH0770 and PSPPH0944 were flanked by transposases. However, the unique RRs PSPTO2329 and PSPTO5574 were disrupted by transposases [25, 27], and it is unlikely that these genes encode functional products. Finally, 11 TCS proteins were only shared between two of these P. syringae pathovars. Variations among P. syringae pathovars were also produced by the insertion of mobile genetic elements or point mutations in TCS genes resulting in disrupted reading frames. PSPTO2326 and PSPPH2083 encoded truncated hybrid HKs by comparison with the length of their orthologue PSYR2113 (Table 4) that is located next to the unique RR PSYR2114. PSPTO2326 and PSPPH2083 were located adjacent to a transposase and to a site-specific recombinase, respectively. Probably these elements caused the disrupted hybrid HKs and the lack of PSYR2114 orthologues in Pto DC3000 and Pph 1448A. Similarly, PSPTO2983 (baeS2) and PSPPH2510 encoded truncated HKs compared to the length of their P. syringae orthologues, and PSPPH2980 was interrupted by an ISPsy18 transposase. PSPTO2983, PSPPH2510 and PSPPH2980 HKs were unpaired without a RR gene in its vicinity, whereas their P. syringae orthologues are located on TCS gene clusters with adjacent RRs (Table 2). Although the PSPPH1362 gene was disrupted by an authentic frameshift, Psy B728a (PSYR1292) and Pto DC3000 (PSPTO1482) orthologues encoded intact hybrid HKs with similarity to BvgS of Bordetella species that controls the regulation of many virulence factors . In each pathovar, these hybrid HK genes were adjacent to orphan RR genes transcribed in the same direction (PSYR1293, PSPTO1482 and PSPPH1363), and their encoded proteins exhibited significant homology to the PvrR RR of P. aeruginosa PA14 which controls antibiotic susceptibility and biofilm formation , and to the virulence related protein VieA of Vibrio cholerae . In this article we present a thorough analysis of the identification and distribution of TCS proteins among the sequenced genomes of P. syringae. A large set of TCS proteins is required for the capacity of P. syringae to detect and adapt to changing environments during plant association and pathogenesis. Moreover, P. syringae has been isolated from non-plant environments such as river epilithon (rock-attached biofilms)  in which TCS proteins may have also important regulatory roles. P. syringae pathovars posses between 68–70 HKs and 92–95 RRs (Table 1), however there is little information describing their regulatory functions and the major part of these TCS proteins is uncharacterized. Many of the TCS proteins investigated so far in P. syringae have been shown to be involved in plant pathogenicity and association with host plants. The orphan RRs HrpR and HrpS are involved in a complex regulatory cascade that activates the transcription of the Hrp type III secretion genes and all known effector genes [42, 49]. Expression of the type III secretion genes and effector genes is also regulated by the particular TCS GacA/GacS  and the RhpRS system . Furthermore, the GacA/GacS system controls the expression of a variety of virulence factors, including protease and syringomycin biosynthesis . The TCS CopRS and the modified CorRSP system regulate resistance to copper  and coronatine synthesis [43, 44], respectively. Finally, the hybrid HK PSPTO2896 contains an N-terminal LOV (light, oxygen, or voltage) domain and is blue-light-activated . Bacteria with large genomes are disproportionately enriched in regulatory proteins involved in transcription control and signal transduction compared to medium and small-size genomes, and typically have complex regulatory networks relative to bacteria with smaller genomes [55–57]. The existence of large numbers of HKs and RRs in P. syringae strongly suggests that TCS proteins play important regulatory roles in the adaptation of this bacterium to different plant and non-plant environments. Comparative genomics of closely related species of pathogenic bacteria represents a powerful tool for the identification of genes potentially involved in host specificity and pathogenesis. The availability of the genome sequences of Pto DC3000, Psy B728a and Pph 1448A provides us with the unique capability of comparing the complement of TCS proteins in these P. syringae pathovars that differ in host range and other interactions with plants. This comparative genomic analysis reveals a core of orthologues and important differences in TCS genes between P. syringae pathovars. It is especially worth noting the high number of genes encoding orphan HKs and RRs in these genomes. Moreover, differences in the repertoires of TCS proteins are likely to facilitate the adaptation of P. syringae pathovars to different plant hosts and/or could be responsible for the different disease characteristics induced. Consequently, the TCS proteins unique to each P. syringae pathovar are interesting targets for future investigations to identify TCS proteins involved in the different host ranges and/or plant pathogenesis. However, the challenge remains to associate these differences in TCS proteins to specific traits of P. syringae pathovars. Additionally, pathovar-specific differences in gene content might be used to design targeted approaches for disease control and could allow the precise PCR-based diagnosis of bacterial diseases . Analysis of the regulatory functions, molecular mechanisms and signal transduction pathways of TCS proteins should contribute to the understanding of the complex events that occur in P. syringae during pathogenesis and adaptation to different plant hosts and different non-plant environments. Rapid progress in the study of TCS proteins is being made by the combination of molecular genetic approaches with genome-scale analysis . Genetic and biochemical studies are necessary to further explore the signal transduction pathways mediated by some of these TCS proteins at the molecular level: construction and analysis of deletion mutants in TCS genes in order to determine the signals sensed by the HK and the targets for the RR of each system. In addition, the application of more extensive analysis with global methods, such as DNA microarray studies reported for B. subtilis  and S. pneumoniae , might allow defining the regulons and the potential regulatory functions of TCS proteins in response to environmental signals. Furthermore, unravelling these signal transduction pathways could potentially lead to the design of innovative strategies to control P. syringae. In conclusion, this comparative genomic analysis constitutes a basis for future functional genomic analysis of P. syringae to establish which TCS proteins participate in the pathogenesis and the adaptation to different plant and non-plant environments. The identification of HKs and RRs is based on the computational domain analysis of protein sequences. The approach used to identify putative HKs and RRs from the complete genome sequences of Psy B728a, Pto DC3000 and Pph 1448A was similar to that described previously  with slight modification. Briefly, five different HMM profiles (accession numbers PF00512, PF07568, PF07730, PF07536 and PF06580) were found in Pfam database that target different families of HKs (HisKA, HisKA_2, HisKA_3, HWE_HK and His_kinase). The HWE_HK domain is defined by the absence of a recognizable F box, and the presence of a highly conserved H residue and a WxE motif within the N and G1 boxes of the C-terminal transmitter domain, respectively . These five different HMM profiles were used to recognize the different HKs in the P. syringae genomes, and hits with a E-value below a selected cut-off (10-6) were extracted. A profile HMM downloaded from Pfam protein families database , which targets the RR REC domain (accession number PF00072), was used to recognize the RRs in each P. syringae genome. Hits with an E-value below a selected cut-off (10-12) were extracted. Additionally, the CheA HK of Escherichia coli  was used as template in BLASTP searches to identify CheA-like HKs in the P. syringae genomes and hits with an E-value below a selected cut-off (10-10) were extracted. Hybrid HKs (REC-HKs) were determined by the presence of complete HK transmitter and REC domains in a single protein. Detection of orthologues of the identified HKs and RRs between the genomes of Psy B728a, Pto DC3000 and Pph 1448A was determined by BLASTP  based on the reciprocal best hits of each P. syringae genome against each other genome, completed by the phylogenetic analyses. Finally, functional domains of the HKs and RRs were identified by search the Conserved Domain Databases (CDD) with Reverse Specific Position BLAST . Multiple sequence alignments and phylogenetic trees of HKs and RRs were constructed using the ClustalW program , and aligned sequences were imported into the MEGA 3.1 program  where phylogenetic trees were inferred. Default parameters were used. Phylogenetic trees were subdivided into groups of orthologues, and co-clustering with members of specific TCS proteins allowed a definitive assignation to a given HK type or RR family. JLL was a recipient of a predoctoral fellowship from the Public University of Navarra. JAO was supported by the Ramón y Cajal Programme and Complementary Action Grant BIO2006-28484-E of the Spanish Ministerio de Educación y Ciencia (MEC). JLL and JAO thank Antonio G Pisabarro and Lucía Ramírez for continued support. DWU and KK would like to acknowledge funding by the Danish Center for Scientific Computing. DWU and JAO designed and coordinated the project. JLL, KK and OR performed the bioinformatics studies and interpreted the results. JAO wrote the manuscript. All authors have read and approved the final manuscript.